Jon and Danielle welcome creator Todd Steinberg and artist Matt Rox from the the soon to be hit program, Don’t Tell My Wife I’m a Cult Leader, and curator (and fellow artist) for the Kessler Sept. 3 show, Misty Amber Moore into the cat studio for a car horn-side chat. Later, Gray, the New Black discuss how the band was formed and their musical influences. They also perform a brand new song called, “Ringtones and Royalties” before hitting the road for Austin where they will be performing at the Flamingo Cantina August 25th. You can see the band, the premier of Don’t Tell My Wife I’m a Cult Leader, and meet everyone you heard on this show Saturday, September 3rd at the Kessler Theater. Did we mention that it was free??? Head over to the Angelika Sept 23rd for a screening of Don’t Tell My Wife I’m a Cult Leader at the Dallas Video Fest!! Music featured on this episode includes the theme music for Don’t Tell My Wife I’m a Cult Leader performed by Andy Sperandeo, and “Ringtones and Royalties” and “Counting the Holes in my Heart” by Gray, The New Black. 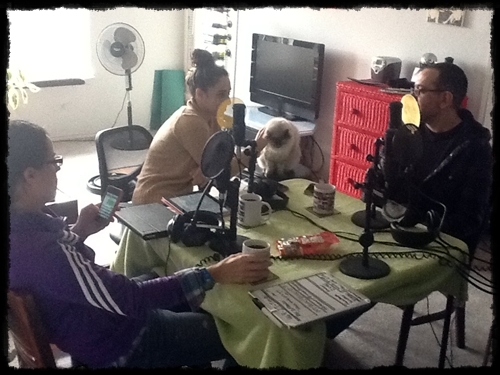 Diane and the pips interview recording artist Tim Moyer on a special episode of Secretly Timid. Topics include his new video for his song “Eleven,” faith and spirituality, his involvement in Playing for Change, and his new record label, Naked Acoustic. Be sure to check out his tunes on Amazon, and if you are in southern California, see him live with Shawn Mullins at the Coach House May 17th. Also, be on the look out for Tim at the “Tools for Performing Songwriters” clinic.